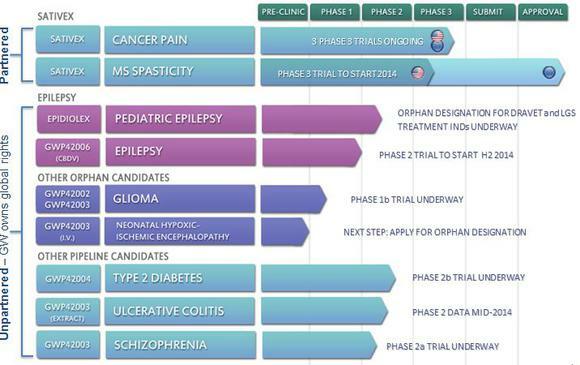 In the U.S., GW Pharmaceuticals isn’t even prioritizing approval for multiple sclerosis spasticity. Its lead indication is in cancer pain. A phase 3 trial with its U.S. partner Otsuka Pharmaceutical testing Sativex in cancer pain will read out toward the end of this year. It’s potentially a larger market — sales of Teva’s pain medication Actiq peaked at more than $600 million — but the sales potential will depend on how well Sativex reduces pain, its side effects, and the potential for abuse. There are quite a few opioid pain medications that are available as cheap generics, but they can cause constipation as a side effect, which could give Sativex a leg up. For multiple sclerosis spasticity, GW plans to start a phase 3 trial in the second half of this year to get the drug approved in the U.S. A pot full of drug candidates Beyond Sativex, GW Pharmaceuticals is developing Epidiolex, another marijuana-derived chemical called, cannabidiol, or CBD, for two types of childhood epilepsy: Dravet and Lennox-Gastaut. Independent investigators are currently testing Epidiolex on their own, and GW plans to start a clinical trial in the second half of this year, which would put it on track to start pivotal trials in 2015. GW also has four other marijuana-derived drugs in its pipeline, for a variety of other diseases including diabetes, schizophrenia, and lucerative colitis. Source: GW Pharmaceuticals Risk and reward Investors need to forget that GW Pharmaceuticals is a medical marijuana stock and treat it like any other drug company.